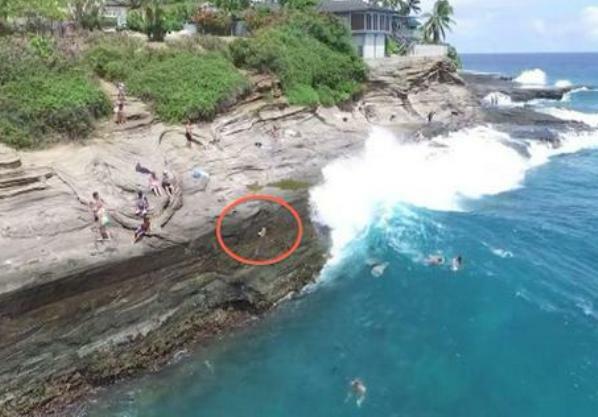 A small dog left behind on a cliff in Oahu when his irresponsible dog dad jumped into Maunalua Bay was swept into the water himself by a giant wave. The dog tried running away from the sudden swell, to no avail. Fortunately, he survived and his dog dad was able to rescue him. The entire scary incident was captured on camera by Donny Klotz’s drone. Although warning signs — and no dogs allowed signs — are posted at the entrance to China Walls in Hawaii Kai, Honolulu Emergency Services Dept. spokeswoman Shayne Enright told Hawaii News Now people ignore them. In January, a 23-year-old man died when he was swept off the same ledge by a wave. Many angered animal lovers have left comments criticizing the dog’s owner on the Hawaii News Now Facebook page.